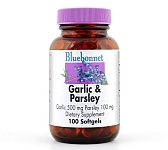 Bluebonnet’s Garlic & Parsley 500 mg Softgels provide pure garlic from fresh garlic bulbs that are odor reduced. Plus pure parsley seed oil. Available in easy-to-swallow softgels for maximum assimilation and absorption.